2. . 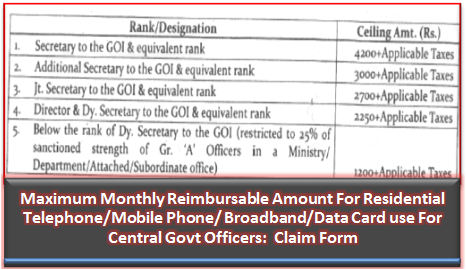 Eligible officers of Department of Telecom may now opt for either reimbursement of charges on Residential Telephone/Mobile Phone/Broadband/Data Card use (for internet purposes) Plan as per Deptt. 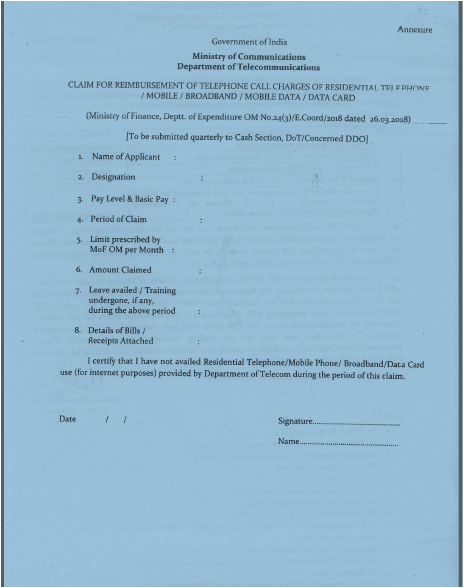 of Expenditure OM quoted above or to avail the facility provided by Department of Telecom vide circular No. 3-1/2013-PHP dated 22.06.2016. 3. In case officers opt to avail facilities according to Ministry of Finance circular vide para 1 above they will have to surrender the Residential Telephone/Mobile Phone/ Broadband/Data Card use (for internet purposes) facilities provided in accordance with DoT Circular No. 3-1/2013-PHP dated 22.06.2016. While submitting their bills/receipts to the concerned DDOs (as per enclosed annexure) for reimbursement as per DOE OM dated 26.03.2018, they will be required to furnish a certificate to the effect that they are not availing Residential Telephone/Mobile Phone/Broadband/Data Card use (for internet purposes) in accordance with the DoT circular No. 3-1/2013-PHP dated 22.06.2016 asamended from time to time. 4. This issues with the approval of Secretary (T). The Department of Expenditure has from time to time issued instructions on provision of telephone facilities. monetary ceilings on reimbursement to the officers of the Government of India, Given the increasing dependence on telecommunication technology including mobile telephones for carrying out official work. the existing instructions have been comprehensively reviewed. revised and the following instructions are hereby circulated for compliance by all Ministry/Departments. In supersession of all earlier instructions issued by this Department on the subject.